The saying goes, "It's not a quilt until it's quilted". But so many of us end up with unfinished projects that get stalled at the quilting stage. Maybe that's the time to consider sending your quilt top to a Longarm Quilter. What should you expect in partnership with a Longarm Quilter and what do they expect from you? Our member experts will be answering those questions, this month, as they cover topics such as: batting, backing, thread and design considerations. You'll learn how each of them got started with Longarm quilting and what makes each of them unique. Carol Alerpin - Carol first learned to quilt in the early 80s, but didn't catch the quilting bug until 1998 when her daughter left for college. 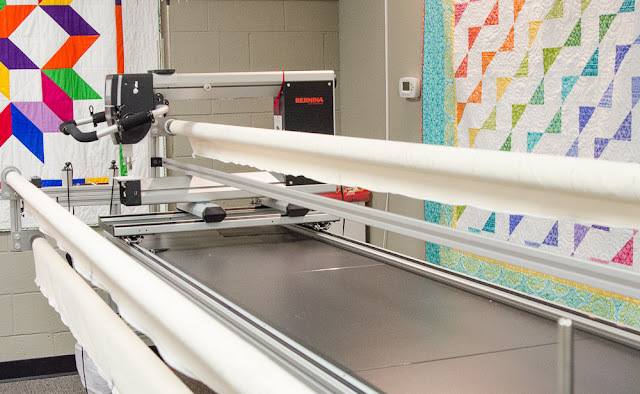 She worked as a computer programmer for 23 years, but after quitting that job, she found she had made enough quilt tops to invest in a longarm machine. Her quilting obsession quickly moved from making tops to quilting quilts. Carol has been an active member of the SC quilting community, leading the Longarmers of the Upstate Group, serving in several capacities for both Foothills Piecemakers QG and Nimble Thimbles QG, and serving on the board of the QSC as newsletter editor. Fannie Wengerd - Fannie grew up in Lancaster, PA. Her mother was a quilter and made a quilt for each of her 10 children. Fannie made her first quilt in 1966 for her son and hand quilted it. After making that first quilt, Fannie decided that quilting took too long and lost interest until she learned to machine quilt on a domestic machine from Harriet Hargrave in 1990. She continued to make quilts using her domestic machine until buying a longarm in 2003. Fannie was the first longarm quilter in the area and has won ribbons throughout the country for her work. She has served as a board member for Electric City Quilters and has been teaching at Anderson University with the Lifelong Learning Program since 2014. Johellen George - Johellen started sewing before she started school! She has been a lifelong sewer of camping gear, lingerie, clothing, doll dresses and started quilting before the rotary cutter came along. When 4 grandchildren arrived within a year, machine quilting became a necessity, but Johellen found quilting on a domestic machine wasn't much fun. She found that she enjoyed quilting on a longarm and purchased one when she retired from teaching school. Johellen has been quilting for customers for several years and teaches classes in free motion quilting and ruler work on the longarm. Turn right out of Bernina onto E. North St. Drive 2.5 miles to Mitchell Rd. Turn right onto Mitchell Rd. Drive 0.5 miles to Hudson Rd. Turn left on Hudson Rd. St. Giles is on the left side immediately after the light at the intersection with Devenger Rd. Fellowship hall is located behind the Sanctuary and is the second building with the covered pathway. This is the last reminder to pay your 2019 dues of $50. According to our Bylaws, dues must be paid by January 31st or members will be dropped from both our roster and membership in the Modern Quilt Guild. The December BOMs, the Chicken Block and the Dog Gone Cute Block can be turned in at the January meeting. We look forward to seeing your modern Show and Share projects! 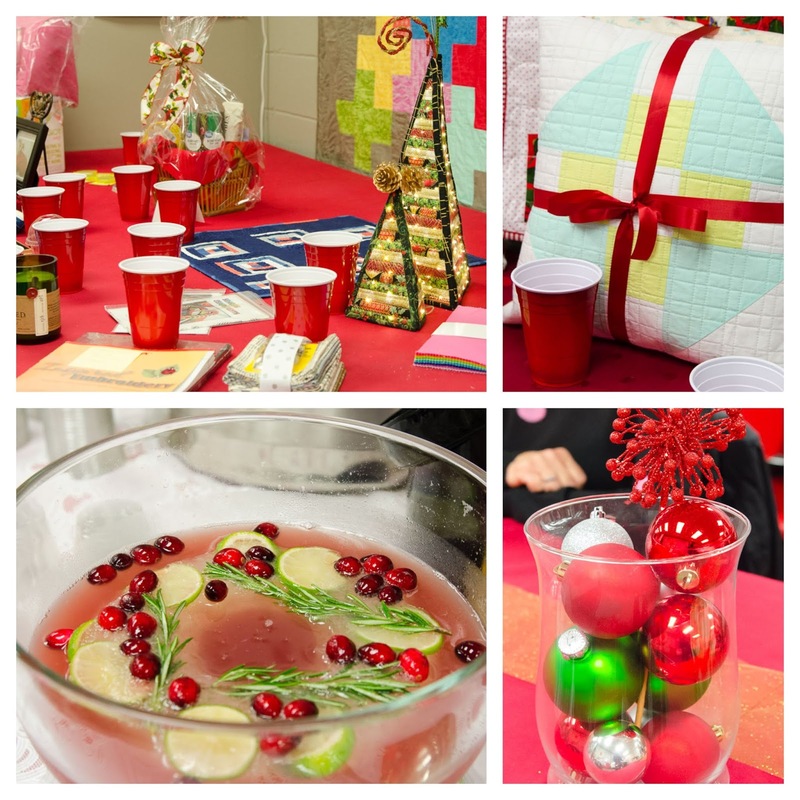 Our Annual Holiday Party and Auction! 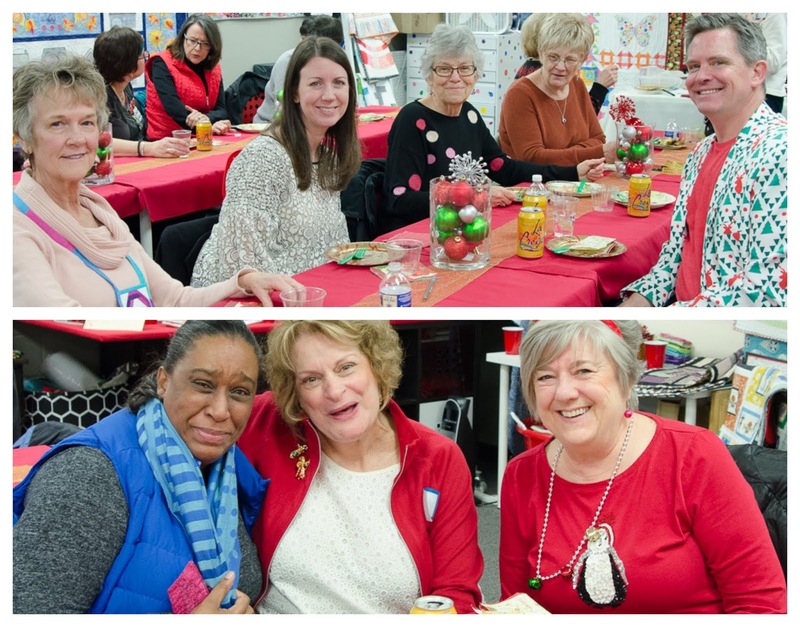 This month we celebrated a great year for Greenville MQG with a holiday party! Many thanks to our 2018 party planners, Darlene, Sandy, Jill and Dana! Thank you also to Leslie for decorating and hosting, all of those who brought food and dessert and everyone who contributed items for our auction. As you can tell from all the smiling faces, a festive time was had by all! We enjoyed a beautiful holiday atmosphere, wonderful food and many went home with one or more gorgeous raffle wins. Thank you to the 2018 GMQG Board Members and anyone who volunteered this year! Thank you to Leslie and the staff at the Bernina Store for hosting our guild the past several years! 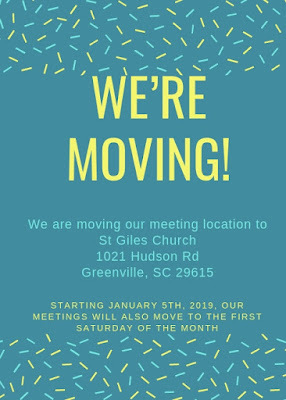 Reminder: Our meetings will be moving to St. Giles Church and we will be switching to the first Saturday of the month. 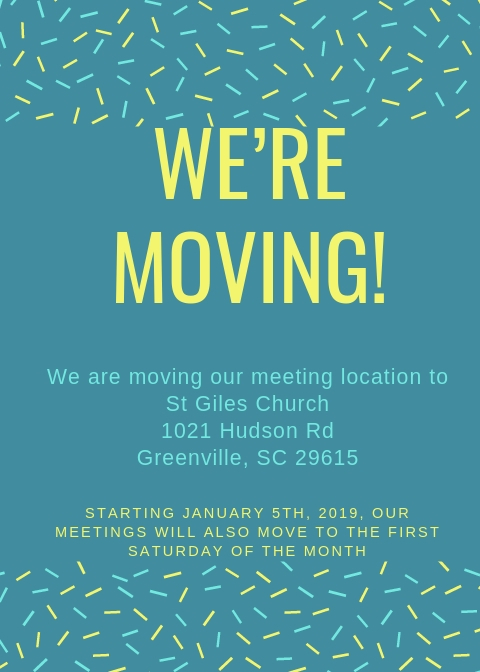 For January 5th only, the meeting will be held from 12-2 pm. The meetings will be held the first Saturday of the month from 1-3 pm for the remainder of 2019. Your 2019 dues of $50 are due by the end of December. Checks can be mailed to Paige Alexander. The December BOMs, the Chicken and Dog Gone Cute blocks, can be turned in at the January meeting. Cheryl Brickey is presenting a workshop, "EQ8 for Beginners" on January 26th, from 2-5 pm at the Taylors Library. The workshop is free, but you must register. Find all the details here. The 2019 Retreat will be held April 25-28. Registration will open at the January meeting and is limited to 24. 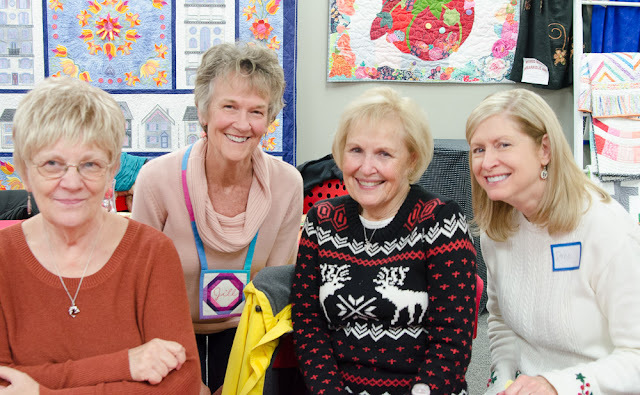 Our program for January will feature longarm quilters, Johellen George, Fannie Wengerd and Carol Alperin. 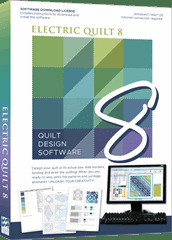 They will be sharing all you need to know about having your quilt tops quilted. We are excited to announce that GMQG will be hosting Kitty Wilkin from Night Quilter in 2019! She will be doing a lecture on Friday evening, May 31st and two classes: a 3 hour class on May 31st and a 6 hour class on June 1st. We would like to have your input before choosing which of Kitty's classes to offer. A description of all the lectures and classes are listed below. Please read through them and use the Survey Monkey link below to rank your favorite topics. We'll be announcing the results in a future post and you'll be able to start signing up for classes at the January meeting. The survey will be available until December 19th. Explore the world of fussy cutting and see the many ways you can apply it to your projects to take your quilting to another level. Fussy cutting, or the practice of intentionally cutting a specific motif from a fabric design, is a fun technique that can be applied to any project. There are many different ways to add a touch of meticulous to your quilting projects, whether traditionally pieced, foundation paper pieced, or English paper pieced. Kitty will show examples of the many ways fussy cutting can be applied to quilting, will show ideas on how to make your own planning templates, and will share tips and tricks on successfully cutting, basting (if applicable), and accurately stitching your carefully cut fabrics so that you can use some meticulous magic to transform your next project. What do you get when you combine journaling with quilting, and add a little bit of photography? Milestone quilts! Come explore the world of quilts created to mark milestones, and see why these quilts are a fun and meaningful solution to joyful sewing in this busy world. Join Kitty as she shares the milestone quilt she created for her third child to mark his first year of life, and explores other life events that can be documented through the creation of a quilt. Leave feeling inspired and ready to document your days through quilt-making, one attainable goal at a time. In this workshop, you will learn the basics of foundation paper piecing, but also an arsenal of tips and tricks to ensure you never have to rip seams again (well, or at least very, very rarely!). Foundation paper piecing is a quilting technique with which you sew fabric pieces to a paper foundation by sewing along predrawn lines, allowing for perfect points, easily duplicated blocks, and the creation of just about any pictorial or geometric design sewn with fabric. With a bit of practice and some helpful hints along the way, foundation paper piecing opens a whole new world of quilting. Come sew tiny with Kitty! Explore the world of tiny piecing in this playful class where we’ll experiment with sewing blocks that finish at a whopping 1 1/4” square! Kitty will share tips and tricks for sewing tiny so that you can set yourself up for success in your future tiny stitching endeavors. 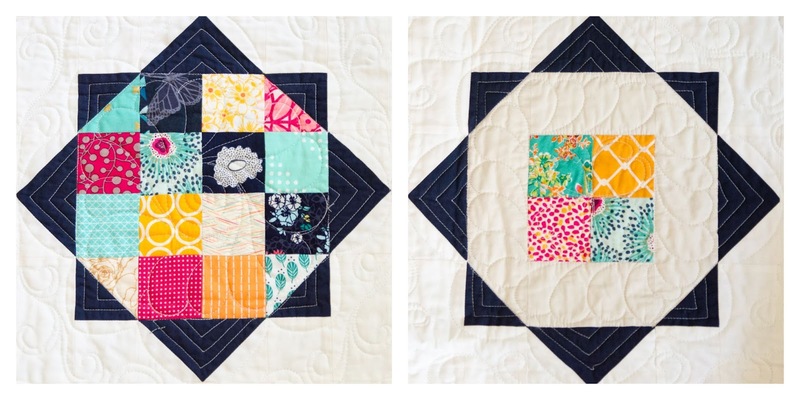 Beginning with traditionally pieced and improv blocks, and moving to more intricate and precise foundation paper pieced blocks, you’ll leave this class giggling at the absurdity and marveling in amazement at your teeny tiny sampler-style quilt blocks. In this workshop, we will talk about the practice of intentionally cutting during the piecing of a quilt, often called fussy cutting, and what it can bring to your quilt making. Kitty will teach methods and share tips and tricks for incorporating fussy cutting into traditional piecing, foundation paper piecing, and English Paper Piecing. We will talk about identifying the focal fabric feature, making your own fussy cutting templates, and how to piece your meticulously cut features accurately. Students will be able to practice their new skills in the beginning of a fussy cutting project of their choosing, and will leave feeling ready to meticulously cut to their heart’s desire. You’ve spent countless hours planning, cutting, sewing, trimming, basting, quilting, and binding your quilt, now how do you document your masterpiece!? Whether you have a point and shoot, a fancy DSLR but simply don't know how to use it, or even a smartphone, Kitty will teach you how to make the most of the tools you have to get great quilt photos for your blog and Instagram. Kitty will discuss photography basics, lighting, composition, and staging, and will share a few inexpensive tools that you can find around your house to take your photos from good to great! Complete with hands on practice, you will leave feeling confident that you, too, can take great quilt photos without buying any fancy equipment. Please bring your camera or smart phone, and a finished quilt (optional—and if time permits)!